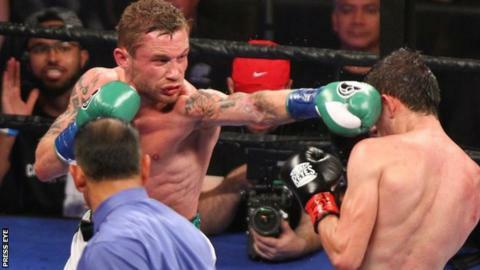 IBF super-bantamweight champion Carl Frampton is targeting a title fight with England's Scott Quigg. Frampton retained his belt with a points win over Alejandro Gonzalez last weekend while Quigg stopped Kiko Martinez to defend his WBA title. "The message is bring it on - I hope we can get an agreement," said Frampton. Frampton hopes fight with Quigg can be organised. "I'm happy to fight him in his own backyard but he just needs to remember who is the boss when it comes to negotiations." The Belfast man was far from his best against Gonzalez in Texas, recovering from being knocked down twice in the opening round to secure a unanimous points victory. On the same night Quigg impressed in Manchester, stopping Spain's Martinez in the second round. Quigg's promoter Eddie Hearn said earlier this week that a world title unification fight with Frampton is "common sense". Frampton turned down a £1.5m offer from Hearn in April to fight Quigg. "We will go back with a revised offer and try again. It's the biggest fight for them," added Hearn. Meanwhile, Frampton has decided to remain at super-bantamweight after considering a move up to featherweight when he struggled to make the weight for the Gonzalez fight. "I'm a career super-bantamweight - I just misjudged things, just got things wrong a little bit," he said. "I can make 8st 10lbs again if I have to. It's never comfortable, it's never easy and it's a hard slog to do it."